A question we get asked quite often is "what kind of plus sockets are used in Thailand?"... If you are bringing electrical equipment like a laptop or battery charger for your camera or torch, you better have the right plug! The photo below shows typical plug sockets - those shown have 3 pins - some sockets have just 2 pins. 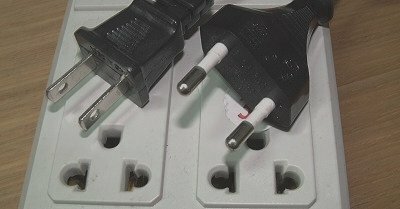 Your plugs should ideally be 2 pin - either round pins or flat pins. You can buy adaptors at any airport, best to have them before you get here, although most hardware shops will sell them for a few dollars.